In addition to the 4 cats, our menagerie also includes 2 dogs! Watson, a playful German Sheppard who loves chasing and retrieving oranges! Cluso, an old (we have no idea how old he is, but he seems old, or maybe he’s just very lazy) Belizean mott! Bone time, best time! We get bones from the meat processing plant, and even the cats love hem! Then it’s time for a nice walk with the kitty cats! There is no better way to end a hot day… the creek is our favorite place to be! Tes chiens sont vraiment super! Est-ce que tu t’es vite adaptée aux chiens. Tu ne sais pas l’âge de Cluso???? Ça coûte très cher ici pour les soins de vétérinaire? I saw a web page about your home for sale and I cannot find the listing on the Rainforest website. How much are you asking? Is there pasture for horses?? You cannot find our house on the Rainforest website because it has been sold. 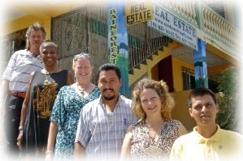 There are many places for sale in Belize that have pasture for horses, you will find something. Good luck in your search! We lived there from September 2006 to 2009. We sold the property and the buyer is still there. It is located within a Mennonite community. I know that some of the Mennonite have properties for sale, and so is the Barton Creek Outpost. It is an amazingly beautiful place, but there are some down sides as well. Have you been reading the Belize Forum? Lots of info there! Hi Tropicat! I’m selling some land in Belize where I have been living, I’ve made my own website but do you have any tips on where I can advertise it to get more exposure? Do you have any links pages (I’m not very good at navigating blogs) where you could put a link to it maybe? Thanks for any advice! We are taking the plunge the first of next year. No idea of where to start. Any suggestions?